Gods Without Name expresses an ancient darkness, rustic, agrarian, … provincial but horrific. This is an unmistakable motif here, and although it manifests in the music, it is the related material that really sets up that premise. The album artwork gets significant credit for pushing the listener in this direction. Occult magicians stand within and afront a remote, dilapidated structure, long anguished by the ebbs of an unnatural decay, dressed in blackened, pseudo-historical, almost puritan-esque garb, wielding wicked tools of the harvest. 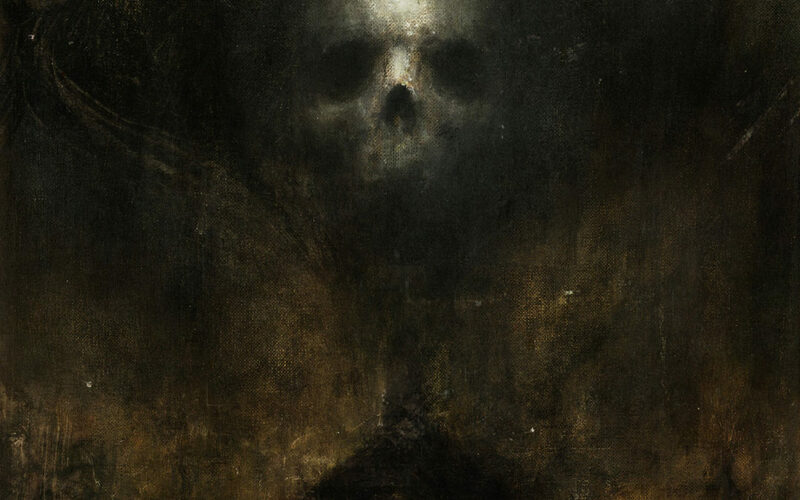 The front cover art depicts what could only be this same structure, ‘neath an ominous, opaque, arcane deathmask, hovering above the plot as cloud of shadow and chaos. The introductory track “Parallax I” haunts the first moments of the album with a static, dissonant uttering, the death throes of some decrepit vintage phonograph, as daemonic winds howl in just beyond the thin cold window… for the storm is brewing. Tempest approaches with “Holy Mother of Terror”, almost another introductory track unto itself, with a swirling, churning evil periodically overrun by sudden vicious pelting and a nauseating pitch reduction. It touches down with the howling, ghostly wrath “Of Harvest, Scythe, And Sickle Moon”, guitar lead winding and coiling with malice around sinister, ritualistic beats which suddenly and repeatedly explode into a flurry of double kick, replete with spectral moaning, and vague eerie industrialization. But it is not until the absolutely monstrous title track, with its classically influenced, violently grandiose, audaciously savage blasting, that the listener is exposed to the full force of this maelstrom. The eye of the storm is not even a song but rather a lingering ghostly ambience placed between this track and the next. There is no respite with the next offering, the fury of the “Thresher”, a devastatingly crushing piece featuring not only a scathing guitar lead but also the repetitive vocal line “I am… the THRESHER!! !” which sticks with the listener like a possession, highlighting the power of Naas’ voice, which dominates the entire album with a focused, dense, infernal rasp, frequently set upon by layers of additional and supernaturally malevolent multiplicities. The torrent begins to relent just barely, and the listener gets the impression that the gale has begun to move just abreast with the more dissociated “Watcher on the Threshold”… even so, the paranormal hurricane reaches from (slightly) afar, lashes the helpless soul with a vindictive spite, and the track ends with possibly the most relentlessly heavy and sick progression of the entire album. “Prayer of Abjection” truly marks the end of the onslaught, the calm after the storm, an industrial-ambient song comprised of the groan and slamming of some sort of thunderous archaic machinery, the gravity of which has only been compounded by centuries of rust and sacrificial blood. The clouds have moved to the distance with “Dread Spirit of the Place”, a hypnotic, contemplative, doom-laden epic, which nonetheless sees fit to punish the listener with one more minute of catastrophic blasting before raging away into the thick black night. “Parallax II” ties it back to the beginning of this horrendous narrative with the same aesthetics that ushered in the Gods Without Name, and nothing but wreckage and darkness remain. This album is a masterpiece of metaphysical ruin incarnate. For fans of… not a lot besides (obviously) Nightbringer, Bestia Arcana, and Akhlys; but also, some less pronounced similarities with Borgne and Helleborus.